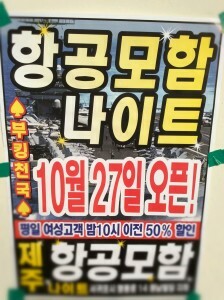 If you have casually walked around the Seogwipo city lately, you would have mostly likely seen the new flyers about the opening of a new night club called the “Aircraft Carrier.” And how could you not? It’s literally taped in the walls of every corner around the neighborhood. Like a parasite, it invades homes, restaurants, and clothing stores with its bright, oversized letters screaming about cheap ladies that you can get for “50% off.” Every time I see it, I feel like an organism has infiltrated deep inside me as well, sickening me at the moral core. If you see the advertisement, I feel like you would feel the same way. 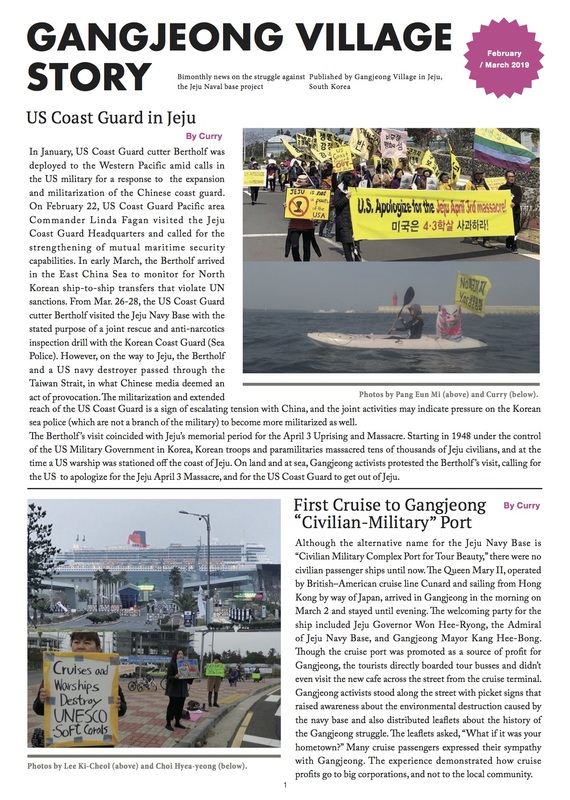 The association of cheap ladies and the background photo of an aircraft carrier personally triggers the image of prostitution sites right in front of docked navy ships that will plague the Gangjeong Village. Angie Zelter argued that naval bases brings these types of changes. But to have a clear, physical manifestation of it in a tacky advertisement poster drags the mind from the rhetorical to the real – the visceral. And it feels truly nauseating deep-down. But in a interesting way, the way these third-rate posters are attached everywhere around the area is symbolic and symptomatic of naval bases themselves. Naval bases spread, they swallow everything in their sight, and poison the area with their pathogens in a way that devastates communities internally. Because these effects are real, naval bases are always under negative public scrutiny. Self-conscious, they respond by constantly mailing flyers airbrushed with photos of smiling families followed by a frail logic to somehow justify their existence as moral and just institutions. These flyers (which have surfaced recently as well) share little difference with the advertisement photo above. Both rely on gimmicky methods and feel invasive in the same way.